Revolution is a topical solution. You drop the liquid on to the your dog's skin. My Yorky is 8#and is onTri-Heat Plus,just got it from the Vet. So can I still giv him Revolution Purple?? He really dosent like a flea coller. Any Ideas? The ingredients are not he same so you should be able to use them both at the same time. However we strongly recommend you get advice from your vet before administering any medication. Which internal parasites does it treat and control? As mentioned in the description, it treats fleas, heartworms, intestinal worms, ear mites, scabies, biting lices and American dog tick. What ingredients are in this? Active ingredient is Selamectin . My dog is Chihuahua and 3 years old. he is small about 4.4lbs. I'd like to use Revolution. there are 2 types . one is for puppy and one is for purple dogs. which one is better for my dog? For adult dogs 'Revolution Purple' is recommended. this is good for my dog. 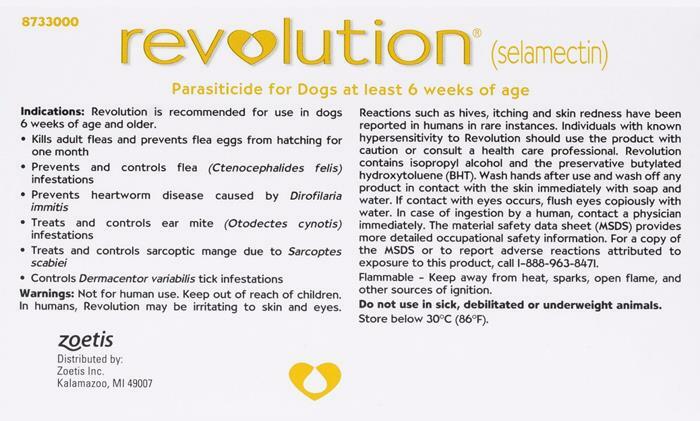 I cannot tell the difference between this product and the Revolution I purchased from my Vet. It does the same job - my Dogs are happy & I am Happy. My pocketbook is very happy. It was cheap and it took about 10 days.